Four Florida State University entrepreneurship students, who operate a biotechnology company focusing on diabetes care, won the grand prize of $15,000 at a competition hosted by the Leon County Research and Development Authority last week. 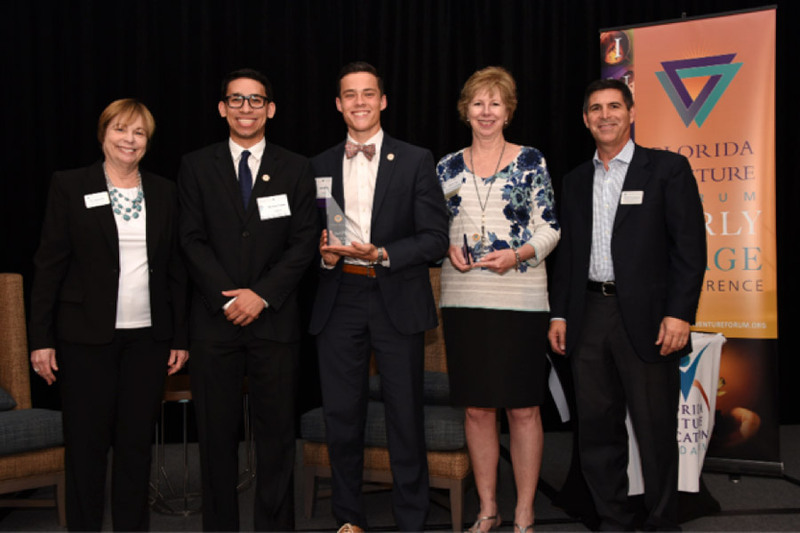 DiaTech, created by Luis Blanco, Nicholas Cooper, JC Gray and John Wilcox, also earned second place at the 2018 Statewide Collegiate Business Plan Competition sponsored by the Florida Venture Forum on May 18. Some of the top entrepreneurship students from 11 universities in Florida made business pitches to judges and investors. Pat Schneider, vice president of the Florida Venture Forum, said past winners of the competition have established a strong record of success in the marketplace. The FSU students created DiaTech with the goal of enhancing technology in insulin pumps so the devices are able to monitor blood glucose levels more effectively. The new design optimizes the delivery of insulin and can alert patients to malfunctions. DiaTech has earned a series of awards at previous competitions. The student-entrepreneurs won the Most Innovative award at the Jim Moran School of Entrepreneurship’s InNOLEvation® Challenge, as well as top prizes at DIGITECH’s Jim Moran Shark Tank and the FAMU-FSU College of Engineering Shark Tank pitch competitions. In December 2015, Florida State University announced the creation of the nation’s largest interdisciplinary, degree-granting school of entrepreneurship, the Jim Moran School of Entrepreneurship, as part of a major gift from Jan Moran and The Jim Moran Foundation. Students will participate in traditional case-study learning along with innovative hands-on application and experiences. Students accepted in the inaugural 2017-2018 class will graduate with a Bachelor of Science or Bachelor of Arts in entrepreneurship.